Creating Shared Value: Doing well by doing good! Relevant research has shown that those companies that had undertaken social and environmental responsibility did prosper in the long run (McWilliams and Siegel, 2001; Orlitzky, 2003). However, other research has indicated that it is also possible to over-spend on strategic CSR — as this is true of all discretionary marketing expenditures (Lantos, 2001). It may appear that there is an optimal level of spending on strategic CSR (Orlitzky et al. 2010). The factors contributing towards creating value are often qualitative and may prove very difficult to measure and quantify, such as; employee morale, corporate image, reputation, public relations, goodwill, and popular opinion (Miller and Ahrens, 1993). Lantos (2001) advocated the need to identify CSR activities that will yield the highest payback. Of course, every stakeholder group has its own needs and wants. Therefore is is important to continuously balance conflicting stakeholder interests and measure the returns from strategic CSR investments (McWilliams and Siegel, 2011; Freeman, 1984). Porter and Kramer (2006) believed that organisations can set an affirmative CSR agenda that produce maximum social benefits and gains for the businesses themself, rather than merely acting on well intentioned impulses or by reacting on outside pressures. 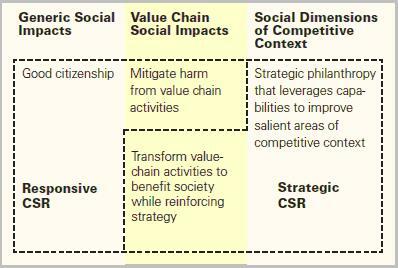 They referred to the value chain (Porter, 1986) as an appropriate tool to chart all the social consequences of business activities. Figure 1 illustrates inside-out linkages that range from hiring and layoff policies to green house gas emissions, as follows. This value chain model presents operational issues which have an effect on the companies’ performance. 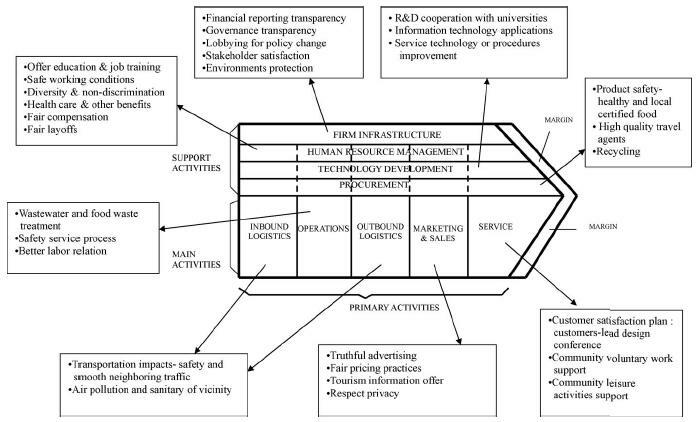 It depicts some of the activities a company engages in while doing business. This model can be used as a framework to identify the positive and negative social impacts of those activities. Porter and Kramer (2006) held that through strategic CSR the company will make a significant impact in the community.They suggested that companies may be triggered to doing things differently from competitors, in a way where they could lower their costs. The authors went on to say that strategic CSR involve both inside-out and outside-in dimensions, working in tandem. Interestingly, the authors indicated that there are ‘shared value’ opportunities through strategic CSR (Porter and Kramer, 2006, 2011). They argued that the companies’ may strengthen their competitiveness by investing in social and environmental aspects, as featured in Figure 2. The success of the company and of the community may become mutually reinforcing (Porter and Kramer, 2006). They maintained that the more closely tied a social issue is to the companies’ business, the greater the opportunity to leverage the firms’ resources and capabilities and will in turn benefit society at large. Falck and Heblich (2007) related the notion of strategic CSR to the shareholder value theory. This approach implied a long term view of wealth maximisation. As it was also the case for the agency theory. These authors suggested that proper incentives may encourage managers ‘to do well by doing good’. “…as the company’s goal was to survive and prosper, it can do nothing better than to take a long term view and understand that if it treats society well, society will return the favour” (Falck and Heblich, 2007).